She's probably new, but that freshness and kooky looks made her way in the fashion blogging world. 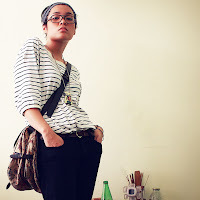 Blogging for only 10 months, she bagged the Best Fashion Blog at Philippine Blog Awards 2009. Runway2Reality interviews fashion blogger, graphic designer and aspiring fashion designer, Elyoo dela Cruz. Elyoo shares how her blog started, her personal style, how she gets inspiration from movies and more. I describe my personal style in 4 words: kooky, vintage, androgynous and comfortable. I'm in love with with the fashion during the 30's and the 70's! I love watching old/period films just to look at the costumes. Fashion Philosophy? Umm, just try to find you style! It's like what they say: Fashion come and go, but style is forever! Can you tell us about your blog. How did you start? How long you've been blogging? It started out of boredom. Haha! I love playing dress-up in my room and one day I just started taking photos of myself. I've been blogging for about 10 months now and loving it! My blog is mostly just about me and the things that I love... and me. Haha! Sometimes I don't want to look at my blog anymore because I'm tired of looking at myself!! You're named one of the best fashion blog of 2009, How do you feel about that? Flattered? Haha! Seriously, I am! I'm inspired by a lot of things, but I think I'm mostly inspired by old/period films. I just watched Coco Avant Chanel and I'm trying to channel my inner french girl! I only have 9 pairs of shoes. Alexander McQueen, Phoebe Philo, Coco Chanel etc. etc! Quote from Coco Chanel: In order to be irreplaceable one must always be different. One of Elyoo's vector art. If you're given the chance to splurge, Shoes or bags? why? Shoes! A great pair of shoes can transform a boring outfit into a fabulous one. What is you biggest splurge or the most expensive item you ever bought? Uh. I don't really splurge on clothes or shoes. When I want something expensive, I usually find a cheap alternative or make it myself! Don't follow trends! Just because it looks good on a model, it doesn't mean that it would look good on you. Buy stuff that you love and play around with it! Don't be afraid to be different!